Hoffman Estates High School held their first ever McTeacher’s Night at the Hoffman Estates McDonald’s on Higgins. The event took place on Thursday, January 26. A McTeacher’s Night is organized to help raise money for local schools by having teachers work at McDonald’s and then giving a percentage of the night’s sales to the school. HEHS school McTeacher’s and staff had an exceptional time at this lively fundraiser. On Thursday the restaurant was taken over by teachers excited to serve freshly prepared meals to students and their families to raise money for the Hoffman Estates Loyal Partners (H.E.L.P). The students and families were excited to see their teachers and Principal Schumacher and Assistant Principal and Activities Director Harlan behind the counter as well as many other HEHS teachers. McTeacher Maggie King wore the pie costume almost the entire night and then McTeacher Kerri Largo took over the pie duties. 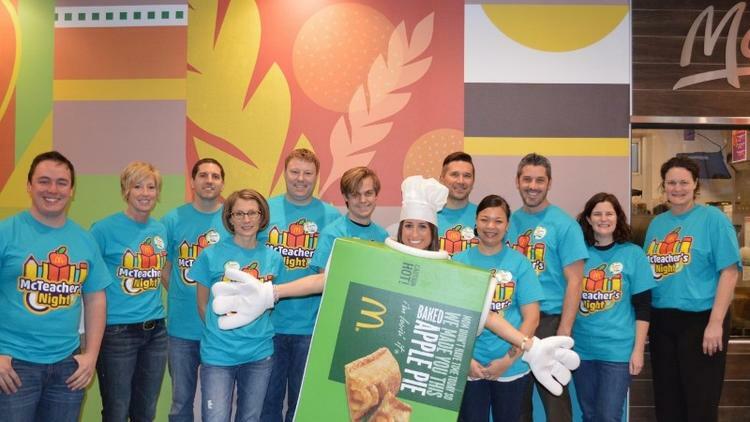 The McTeacher jobs included greeting guests, cleaning the lobby, working the front counter, serving drinks, clearing tables, selling pies, serving ice cream and even dressing up in a pie costume-all duties which were executed with great enthusiasm. A special performance by the HEHS Music Department made the night spectacular. The music was enjoyed by all the families and the staff at the McDonald’s loved it as well. A special thank you goes to H.E.L.P. president Chelle Kase who organized the event as well as everyone that worked and attended the event. Hoffman Estates High School McTeacher’s worked hard and with excitement, while the families also enjoyed a great evening. The Hoffman Estates Loyal Partners plans to use the money raised to go in the post prom fund.